Ina Garten, aka The Barefoot Contessa, and her cookbooks are already a source of guidance for basic recipes but her show serves as my inspiration for more adventurous culinary efforts. I’ll follow along with an episode of the Barefoot Contessa and choose a recipe to try in my tiny New York kitchen. We’ll see if I can keep up with the Contessa! The Set-up: Ina knows a metric ton about rice and how to cook it. 1:06 – Apparently Amelia is originally from Louisiana (yay, authentic!) and it sounds like her family may own/operate the entire small town she grew up in. Very My Cousin Vinny. 2:17 – Amelia explains that this recipe has a ton of chopping involved, first Andouille sausage and smoked ham, then comes ‘The Trilogy,’ aka the basis of Louisiana cooking: onions, celery, and bell peppers. Ina is in full sous-chef mode. 3:44 – Fun facts from Louisiana Cooking 101 – the jambalaya they’re making today is Creole-style and typical of the cuisine in New Orleans (tomato based, derived from Spanish paella). Cajun-style is more meat based and tends to be found inland. 5:26 – As the other vegetables sauté the chopping continues with tomatoes, garlic, and fresh jalapeño. Amelia says traditionally cayenne pepper is used, but she likes the flavor of fresh jalapeño. I have to side with tradition on this one, jalapeño isn’t really my bag. 6:09 – Ina says we’ll need a really big pot for this recipe and I can see why – they’ve put piles of chopped veggies in and we still have to add the rice, shrimp and cooked meats. 10:58 – Time to add more spice in the form of Tabasco sauce – Ina pretends to be apprehensive about the heat, but then promptly loses count of how many dashes she’s added. This could be dangerous, folks. 11:23 – At 24 items the ingredient list for this recipe is really long – “everything but the kitchen sink” – but sometimes I actually like doing a lot of prep. Something about the sense of accomplishment? I know, weird. 12:34 – The rice is done, now time for a little lemon juice, some fresh herbs, and the raw shrimp. This is brilliant: the steam cooks the shrimp perfectly so everything is ready together. 14:19 – Mmmm. 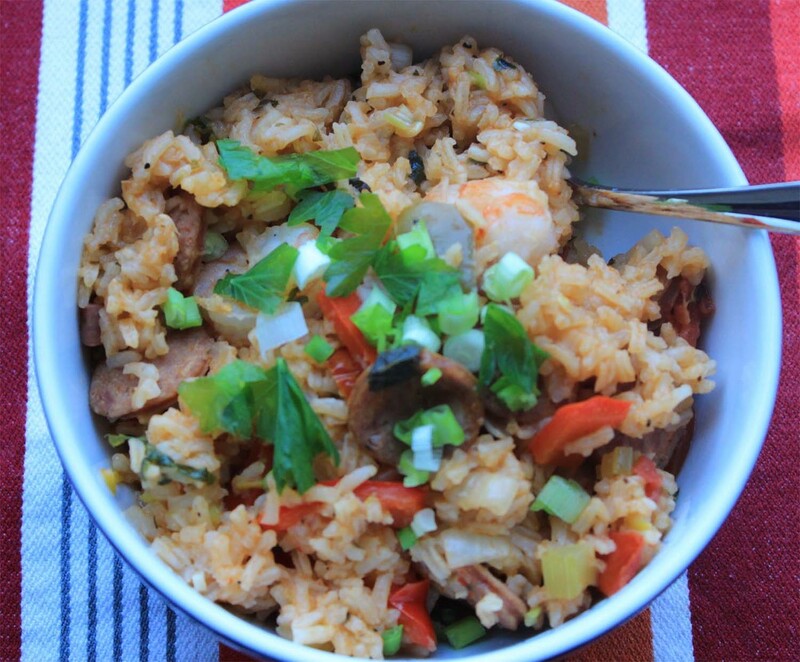 Y’all, this looks awesome – shrimp, rice, sausage, all the brightly colored vegetables. I bet the flavor is a-mazing. 18:11 – Next, we take a little trip to the grocery store with Ina where she explains that there are different kinds of rice (Arborio, brown, sushi) and the importance of using the right kind for each recipe. At no point does she mention Minute Rice, so I’m guessing that’s always a no-go? 19:30 – Since we’re all friends here I feel safe telling you that I have a deep-seated dread of all things ‘porridge’ related. Cream of wheat, oatmeal, bread pudding it all gives me the chills, so Maple Pecan Rice Pudding is going to be a tough one to watch. 20:02 – Here goes. I’m being brave. Ina must know I need a little fortification because she’s soaking the raisins in Bourbon (Maker’s Mark, FYI). 21:35 – I can tell that she’s really trying to help me out because the shots of rice cooking in half and half are kept to a minimum. For rice pudding eaters that probably sounds delicious, for me not so much. 22:54 – How do I know I’m hardened against rice pudding? Even the addition of maple syrup, bourbon, vanilla, and toasted pea-cans (pronounced like a proper Yankee) can’t tempt me. Ina, you’re on your own. 25:13 – Whew, made it through that in one piece. Now it’s Ask Ina time. Question #1: How to cook fluffy white rice? Ina suggests this ratio: 1 cup basmati rice, 1 ¾ cups of water, and a tablespoon of butter. Bring to a boil, then reduce the heat and simmer, covered for 15 minutes. Off the heat, covered to finish steaming for 5 minutes. Seems pretty straightforward. 26:19 – Question #2: How to jazz up plain white or brown rice? This is a fairly silly question, but Ina manages to be kind. She advises using chicken stock in place of water or stirring in sautéed onions or fresh herbs. 27:21 – Question #3: Why does brown rice turn out so wet? I didn’t know this, but Ina says that brown rice is always wetter that white. Who knew? 28:09 – Question #4: The required how to cook Risotto Question. Risotto should cook in 25-30 minutes, no more no less! Add hot stock a ladle full at a time and stir until it absorbs. At the end, mix in lots of grated Parmesan cheese. Cheese makes everything better. 29:22 - Question #5: Do you have a recipe for rice pilaf? She does: Wild Rice Pilaf! Wow, that was a lot of questions. 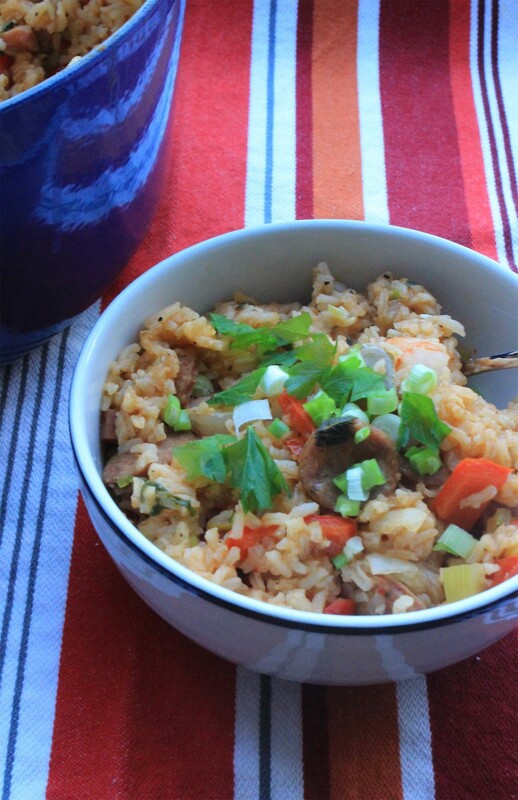 The moral of the story: rice can be used in lots of different savory and sweet dishes. Enjoy! The influences on Cajun/Creole cuisine make it so complex – French, Spanish, Southern – amazing. Rice is actually a much more complex topic than I realized; clearly this needs more study. I’d love to see more guests share some of their regional or family specialties – such a cool look into a different kind of cooking. 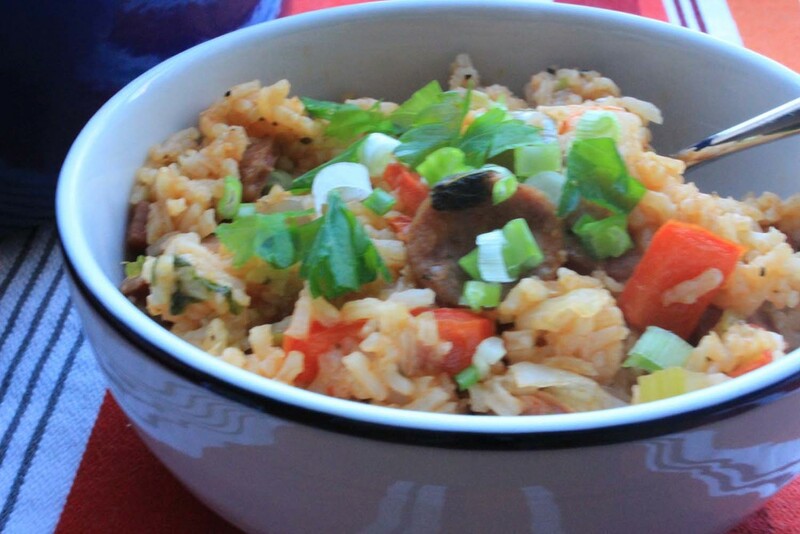 Jambalaya is one of my favorite things to order in Southern restaurants, but I’ve never tried to make it myself. So, naturally I had to try the Shrimp and Sausage Jambalaya – the combination of flavors and ingredients sounded amazing. The list of ingredients is rather long, but 99% (with perhaps the exception of Andouille sausage) are definitely in every grocery store. Overall this isn’t a particularly difficult recipe, assuming you have time to do the chopping. I made this on a Saturday afternoon when there was plenty of time for prep and I didn’t feel rushed through the process. I normally cut Ina’s recipes in half since it’s usually just Mike and I, but I knew leftovers from this dish would re-heat well. The full portion definitely feeds 6-8 people generously. One important note – since different rice brands cook differently; check the package directions on the long-grain, white rice you use to be sure the liquid/rice ratio is correct. I used American Basmati, which called for 1 cup of dry rice to 1 ¾ cups of stock, so I had to reduce the liquid a little. Actually, yes. This is a one pot meal and the kitchen tools needed to make it are minimal. I used a 5 qt dutch oven, a medium sized cutting board, and two small prep bowls to hold the chopped vegetables. I also used a chef’s knife (onions, peppers, etc. ), a serrated knife (sausage, tomatoes, etc. ), a large slotted spoon, a wooden spatula, and measuring cups & measuring spoons.